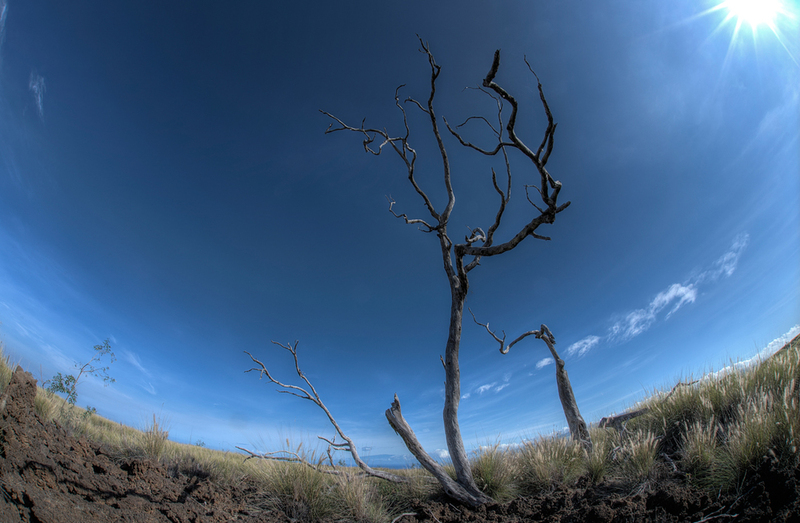 Kohala Mountains, located in the north part of Big Island, are home to seven carved by water and wind erosion valleys. In the southernmost tip of the string, lays the largest and most prized of them all- Waipi’o Valley, or Valley of the Kings, as it is often called. Meaning “curved water” in Hawaiian language, the valley has a rich history of human settlement. This sacred place has a significant role in Hawaiian culture and religion. Since ancient times, Waipi’o Valley served as capitol city and home for many Hawaiian Ali’i (kings) that had chosen this place for its secure location and fertile land. 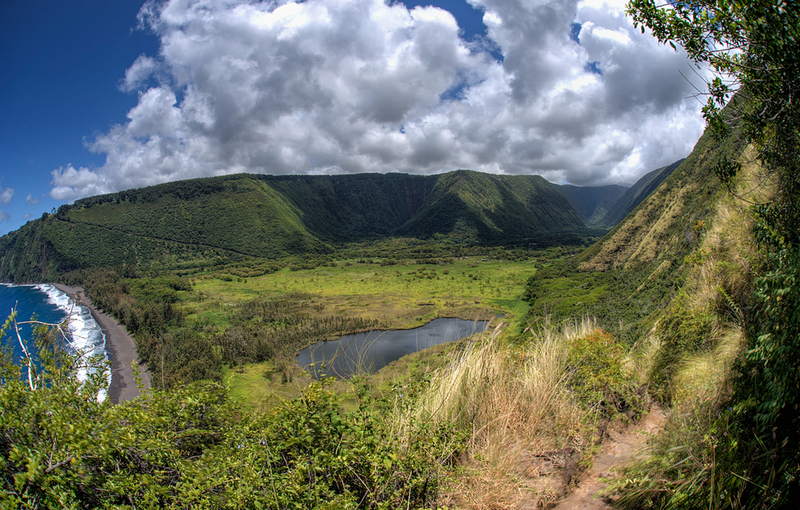 The geological features of Waipi’o Valley are as phenomenal as its human history. Just by looking at it, you take a ride back in time- this is how older islands in the chain started the erosion period of island-forming. In a million years or so, Waipi’o Valley will probably resemble Kaua’i coastline, while the later gets swallowed by the ocean. Waipi’o Valley is quite impressive in size- a mile wide at the shoreline, six miles deep and with cliffs reaching 2000ft (610m) in height. There are also numerous waterfalls cascading down the steep cliffs. No wonder why Hawaiians treat this place with such respect- the sheer beauty is hard to describe with words. It’s a kind of place you have to see with your own eyes to fully appreciate it. Waipi’o Valley is an all-day destination. We personally loved it so much we returned few days later to enjoy it again. Local people call it a soul-searching place and, after spending there two days, we couldn't agree more. Plan to leave early and spend at least couple of hours to fully appreciate what it has to offer. This part of the island is famous for its farmlands- we've passed by cattle and horses grazing on the hillslopes covered in the greenest grass possible, extending far down to the ocean line. If you are coming from Hilo side, you’ll be driving past amazing coastline on Highway 19. Due to lack of time, we only got as far as Akaka Falls on that road so we cannot comment on this part (it’s definitely on our bucket list when we come back to Hawai’i though). From the Kona side, you take Highway 11, which eventually turns into Highway 19 right before Kona Airport. Continue on 19 past the town of Waimea until you reach the village of Honokaa. Turn left at the intersection of Mamalahoa Hwy and road 240 (Honokaa-Waipi’o Road) and continue to the road end (well it doesn't really end here, but keep reading) There is a small parking lot overlooking Waipi’o Valley- this is where most people park they cars and choose one of four ways to descent to the valley floor. cheapest option would be to gear up and hike down (our preferred way and I explain later why), you can also pay local folks for a ride in the back of their pick-up trucks or schedule a guided tour in a 4x4 van. Lastly, you’re allowed to drive your own 4x4 vehicle to the beach. Now let me tell you about the path that leads to Waipi’o Valley, because it’s like nothing I've ever seen. While being paved almost all the way, it a ridiculously steep (average grade 25%), winding, narrow road that you share with hikers at all times. The last section requires high clearance due to uneven, sandy surface. Don’t even think about taking the challenge in a 2WD or AWD vehicle- you’ll either cook the radiator, burn brakes or get stuck in sand (and break your rental agreement as virtually no car rental companies allow their cars past the overlook). When we were visiting there was a gentleman at the booth by the overlook that let people with appropriate vehicles pass the gate. If you’re still think of going, make sure you have enough experience (and nerves) to drive this 4x4 only road, use low gear while going down and advance slowly, watching for pedestrians. We’ve personally chosen to hike down the Waipi’o Valley road. 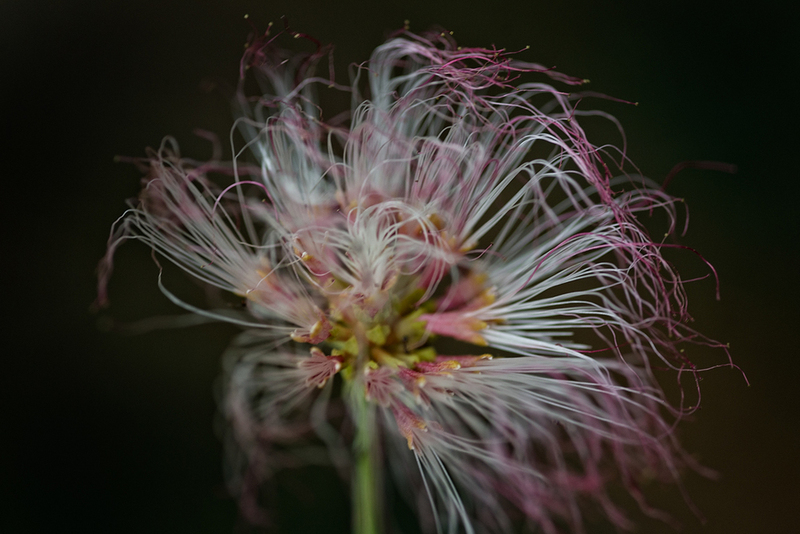 It may sound a little “hippy” when I write it, but taking the round-trip hike from the overlook to Waipi’o Valley makes you appreciate its beauty to the fullest extent. There are many switchbacks with amazing vistas on the road. The distance from overlook to the beach below is roughly 1.5 miles (2.4 km) and takes approximately 45 minutes of walking to complete. The impossibly steep road (we've read that Waipi’o Valley road is the steepest paved road in the entire world, apparently) kicks okole when going downhill, although it’s not extremely crazy if you are in relatively good shape. Around two-third of the way, the road levels and forks- the one on the left leads to a small settlement where current residents live, while the on the right-hand one end at the black sand beach. Generally speaking, most of Waipi’o Valley is in private hands and therefore inaccessible to visitors. We’ve heard stories of unfriendly locals who forced tourists to turn back and leave, but from our experience the opposite was true- everyone we passed was smiling and waving to greet us. We believe these unfriendly encounters happened when people were clearly trespassing private properties and/or were just plain rude to local folks. We need to understand that people live in Waipi’o Valley for a reason- they enjoy their simple lifestyle and ask for nothing but to be left alone. 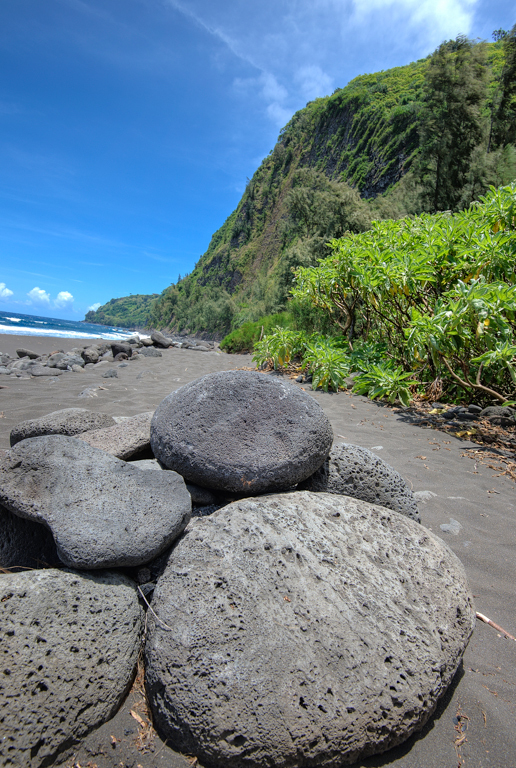 I will point out which parts of the valley we feel are accessible without disturbing its residents later, but let me first write about the road to black sand beach. As beautiful as the beach is, this isn’t all that Waipi’o Valley has to offer. On the right-hand side there’s a waterfall that falls directly to the ocean (paradise, anyone?). You can walk along the coastline to get closer to it if conditions are favorable (low tide and low surf). Bring hiking boots or sandals for this one and watch for loose rocks. 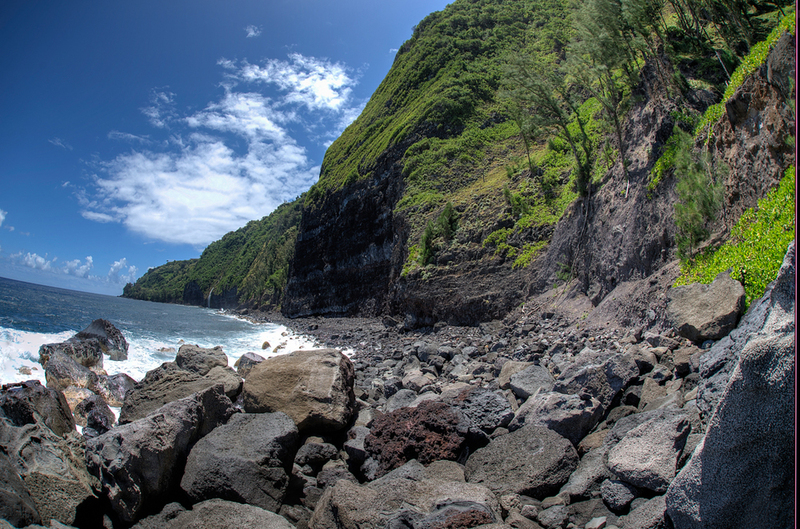 If you’re up for a day of exploration, we recommend hiking a portion of Muliwai trail that starts at the black sand beach and leads through a cliff to neighboring Waimanu Valley. While walking the entire trail in a day would be an extreme tough task (and generally not recommended unless you are an experienced hiker and willing to start at dawn the latest), you can hike to the top of the cliff that separates Waipi’o and Waimanu valleys and back in around 2 hours. Prepare for a strenuous ascend on a dirt path with little shade and the occasional afternoon showers. Bring proper footwear and don’t try to overdo yourself- the best views are half-way to cliff top anyway. To get to the other side of Waipi’o Valley, you need to cross a stream that cuts through the middle and depending on recent weather conditions, it varies from almost dry to a chest deep rapid river (in which case crossing may be too dangerous). Please use your own judgment when crossing the river. On the opposite side of black sand beach, right after the path re-enters the jungle, there’s a fork in the road- the one straight up is Muliwai trail while the one on the left lets you explore the back of the valley (to some extend). If you have some spare time, follow the trail through tropical jungle up to taro fields. There are few “no trespassing” signs along the way, please respect them as this path was made accessible only through generosity of people living here. Also, don’t take any fruits off trees without asking first. The path ends overlooking few taro fields- further down it’s all private land so turn back and return to the beach. 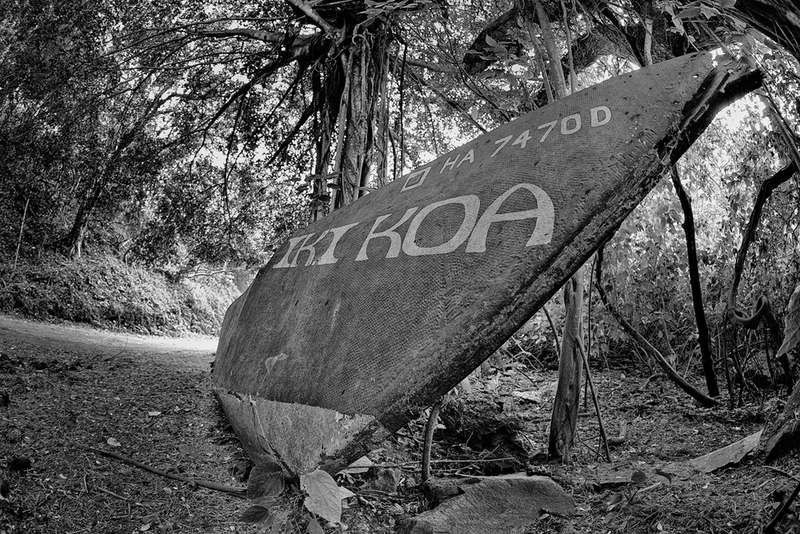 There is one more area to explore before returning to the parking lot – as the road forks at the bottom of Waipi’o Valley, I mentioned one leg goes to a village where current residents live. You can walk for around ¾ of a mile to a vista point overlooking Waipi’o Valley’s yet another amazing feature- Hi’ilawe falls. This magnificent waterfall drops water 1,450 feet (442m) down to the valley floor. At certain times, farmers divert water to feed their crops, but when it’s running, the view is spectacular. This is the closest you can get to Hi’ilawe falls without trespassing, therefore we turned back, waved to a local fellow and his kids taking a ride in a pickup truck and began the last part of our Waipi’o Valley adventure- the hike back to the overlook. We hope that you take our advice and take plenty of water as well as proper footwear because ascend to the parking lot is noting but brutal. While descending to the valley was a serious workout, walking back up is a true challenge. We were actually laughing of how ridiculously steep the road seems to be when hiking uphill. That being said, a good 30-45 minutes walk took us back to the overlook and filled our hearts with a feel of achievement.